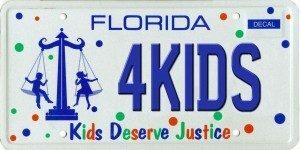 Don’t forget to order the KIDS DESERVE JUSTICE specialty license plate now or at your regular renewal time. The $25 plate cost is a charitable contribution to The Florida Bar Foundation. Every dollar will support grants for children’s legal services.